The Gurkhas (Nepali : गोर्खा) (/ˈɡɜrkə/ or /ˈɡʊərkə/), also spelled as Gorkhas, are soldiers from Nepal. Historically, the terms “Gurkha” and “Gorkhali” were synonymous with “Nepali,” and derived from the hill town and district of Gorkha from which the Kingdom of Nepal expanded. Legend has it that the name may be traced to the medieval Hindu warrior-saint Guru Gorakhnath who has a historic shrine in Gorkha. Gurkhas are traditionally recruited from various Nepali hill ethnicities, but do not come from a single group or region in the multi-ethnic country. Although the Gorkhas found in Himachal are mostly from Nepal, there have been reports of non-Nepalese Gorkhas (such as Thai Gorkhas, Naga Gorkhas and Chinese Gorkhas). There are Gurkha military units in the Nepalese, British and the Indian army (Gorkhas) enlisted in Nepal. Although they meet many of the requirements of Article 47  of Protocol I of the Geneva Conventions regarding mercenaries, they are exempt under clauses 47(e)&(f) similar to the French Foreign Legion. During the Gurkha War (1814–1816) between the Gorkha Kingdom in Nepal and the East India Company the British were impressed by the Gorkhali soldiers which they called Gurkhas. Their war cry was and is to this very day: Jaya Mahakali, Ayo Gorkhali (Nepali: जय महाकाली, आयो गोर्खाली) (Glory to Great Kali, Gorkhas approach!) In the Peace Treaty it was agreed that Gorkhalis could be recruited to serve under contract in the East India Company’s army. Traditionally, recruitment had been only from the Nepali hill groups such as the, Chhetri (Thakuri), Magar and Gurung. 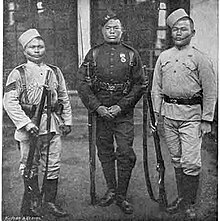 These three castes are the original Gurkhas who fought against British. Brahmin, Sherpa/Tamang were not allowed to be recruited in Gurkha army. Today Gurkhas are from all tribes of Nepal including Gurung, Magar, Chhetri (Thakuri), Rai, limbu, Sherpa, Tamang, Newars, etc. 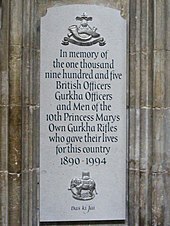 Gurkhas were thought to be a martial race because they were considered to be naturally warlike and aggressive in battle; to possess qualities of courage, loyalty, self-sufficiency, physical strength, resilience, orderliness; to be able to work hard for long periods of time; and to fight with tenacity and military strength. Gurkha soldiers during the Anglo-Nepalese War, 1815 AD. The Anglo–Nepalese War was fought between the Gurkha Kingdom of Nepal and the British East India Company as a result of border disputes and ambitious expansionism of both the belligerent parties. The war ended with the signing of the Treaty of Sugauli in 1816. David Ochterlony and the British political agent William Fraser were among the first to recognize the potential of Gurkha soldiers in British service. During the war the British were keen to use defectors from the Nepalese army and employ them as irregular forces. His confidence in their loyalty was such that in April 1815 he proposed forming them into a battalion under Lieutenant Ross called the Nasiri regiment. This regiment, which later became the 1st King George’s Own Gurkha Rifles, saw action at the Malaun fort under the leadership of Lieutenant Lawtie, who reported to Ochterlony that he “had the greatest reason to be satisfied with their exertions”. As well as Ochterlony’s Gorkhali battalions, William Fraser and Lieutenant Frederick Young raised the Sirmoor battalion, later to become the 2nd King Edward VII’s Own Gurkha Rifles; an additional battalion, the Kumaon battalion was also raised eventually becoming the 3rd Queen Alexandra’s Own Gurkha Rifles. None of these men fought in the second campaign. During the Indian Rebellion of 1857, Gurkhas fought on the British side, and became part of the British Indian Army on its formation. 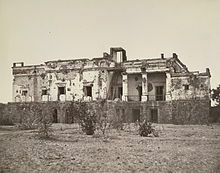 The 8th (Sirmoor) Local Battalion made a particularly notable contribution during the conflict, and indeed twenty-five Indian Order of Merit awards were made to men from that regiment during the Siege of Delhi. Three days after the mutiny began, the Sirmoor Battalion were ordered to move to Meerut, where the British garrison was barely holding on, and in doing so they had to march up to 48 kilometres a day. Later, during the four-month Siege of Delhi they defended Hindu Rao‘s house, losing 327 out of 490 men. During this action they fought side by side with the 60th Rifles and a strong bond developed. Twelve regiments from the Nepalese Army also took part in the relief of Lucknow under the command of Shri Teen (3) Maharaja Maharana Jung Bahadur of Nepal and his older brother C-in-C Ranaudip Singh (Ranodip or Ranodeep) Bahadur Rana (later to succeed Jung Bahadur and become Sri Teen Maharaja Ranodip Singh of Nepal). After the rebellion the 60th Rifles pressed for the Sirmoor Battalion to become a rifle regiment. This honour was granted then next year (1858) when the Battalion was renamed the Sirmoor Rifle Regiment and awarded a third colour. In 1863 Queen Victoria presented the regiment with the Queen’s Truncheon, as a replacement for the colours that rifle regiments do not usually have. From the end of the Indian Rebellion of 1857 until the start of World War I the Gurkha Regiments saw active service in Burma, Afghanistan, the North-East Frontier and the North-West Frontiers of India, Malta (the Russo-Turkish War, 1877–78), Cyprus, Malaya, China (the Boxer Rebellion of 1900) and Tibet (Younghusband’s Expedition of 1905). Between 1901 and 1906, the Gurkha regiments were renumbered from the 1st to the 10th and re-designated as the Gurkha Rifles. In this time, the Brigade of Gurkhas, as the regiments came to be collectively known, was expanded to twenty battalions within the ten regiments. During World War I (1914–18), more than 200,000 Gurkhas served in the British Army, suffering approximately 20,000 casualties, and receiving almost 2,000 gallantry awards. The number of Gurkha battalions was increased to thirty-three, and Gurkha units were placed at the disposal of the British high command by the Nepalese government for service on all fronts. Many Nepalese volunteers served in non-combatant roles, serving in units such as the Army Bearer Corps and the labour battalions, but there were also large numbers that served in combat in France, Turkey, Palestine, and Mesopotamia. They served on the battlefields of France in the Loos, Givenchy, Neuve Chapelle and Ypres; in Mesopotamia, Persia, Suez Canal and Palestine against Turkish advance, Gallipoli and Salonika. One detachment served with Lawrence of Arabia, while during the Battle of Loos (June–December 1915) a battalion of the 8th Gurkhas fought to the last man, hurling themselves time after time against the weight of the German defences, and in the words of the Indian Corps commander, Lieutenant-General Sir James Willcocks, “… found its Valhalla”. During the ultimately unsuccessful Gallipoli campaign in 1915, the Gurkhas were among the first to arrive and the last to leave. The 1st/6th Gurkhas, having landed at Cape Helles, led the assault during the first major operation to take out a Turkish high point, and in doing so captured a feature that later became known as “Gurkha Bluff”. At Sari Bair they were the only troops in the whole campaign to reach and hold the crest line and look down on the Straits, which was the ultimate objective. The 2nd Battalion of the 3rd Gurkha Rifles (2nd/3rd Gurkha Rifles) was involved in the conquest of Baghdad. Following the end of the war, the Gurkhas were returned to India and during the inter-war years, they were largely kept away from the internal strife and urban conflicts of the sub-continent, instead being employed largely on the frontiers and in the hills where fiercely independent tribesmen were a constant source of troubles. As such, between the World Wars, the Gurkha regiments fought in the Third Afghan War in 1919 and then participated in numerous campaigns on the North-West Frontier, mainly in Waziristan, where they were employed as garrison troops defending the frontier, keeping the peace amongst the local populace and keeping the lawless and often openly hostile Pathan tribesmen in check. During this time the North-West Frontier was the scene of considerable political and civil unrest and the troops stationed at Razmak, Bannu and Wanna saw an extensive amount of action. During World War II (1939–45), there were ten Gurkha regiments, with two battalions each making a total of twenty pre-war battalions. Following the Dunkirk evacuation of the British Expeditionary Force in 1940, the Nepalese government offered to increase recruitment to increase the total number of Gurkha battalions in British service to thirty-five. This would eventually rise to forty-three battalions and in order to achieve this, third and fourth battalions were raised for all ten regiments, with fifth battalions also being raised for 1 GR, 2 GR and 9 GR. This expansion required ten training centres to be established for basic training and regimental records across India. In addition five training battalions were raised, while other units were raised as garrison battalions for keeping the peace in India and defending rear areas. Large numbers of Gurkha men were also recruited for non-Gurkha units, and other specialised functions such as paratroops, signals, engineers, and military police. A total of 250,280 Gurkhas served in 40 battalions, plus eight Nepalese Army battalions, plus Parachute, training, garrison, and porter units during the war, in almost all theatres. In addition to keeping peace in India, Gurkhas fought in Syria, North Africa, Italy, Greece and against the Japanese in the jungles of Burma, northeast India and also Singapore. They did so with considerable distinction, earning 2,734 bravery awards in the process and suffering around 32,000 casualties in all theatres. Gurkha ranks in the British Indian Army followed the same pattern as those used throughout the rest of the Indian Army at that time. As in the British Army itself, there were three distinct levels: private soldiers, non-commissioned officers and commissioned officers. Commissioned officers within the Gurkha regiments held a Viceroy’s Commission, which was distinct from the King’s or Queen’s Commission that British officers serving with a Gurkha regiment held. Any Gurkha holding a commission was technically subordinate to any British officer, regardless of rank. British Army officers received Queen’s or King’s Commissions, but Gurkha officers in this system received the Viceroy’s Commission. After Indian independence in 1947, Gurkha officers in regiments which became part of the British Army received the King’s (later Queen’s) Gurkha Commission, and were known as King’s/Queen’s Gurkha Officers (KGO/QGO). Gurkha officers had no authority to command troops of British regiments. The QGO Commission was abolished in 2007. Jemadars and subedars normally served as platoon commanders and company 2ICs, but were junior to all British officers, while the subedar major was the Commanding Officer’s advisor on the men and their welfare. For a long time it was impossible for Gurkhas to progress further, except that an honorary lieutenancy or captaincy was very rarely bestowed upon a Gurkha on retirement. The equivalent ranks in the post-1947 Indian Army were (and are) known as Junior Commissioned Officers (JCOs). They retained the traditional rank titles used in the British Indian Army — Jemadar (later Naib Subedar), Subedar and Subedar Major. From the 1920s, Gurkhas could also receive King’s Indian Commissions, and later full King’s or Queen’s Commissions, which put them on a par with British officers. This was rare until after the Second World War. Gurkha officers commissioned from the Royal Military Academy – Sandhurst – and Short Service Officers regularly fill appointments up to the rank of major. At least two Gurkhas have been promoted to lieutenant colonel and there is theoretically now no bar to further progression. After 1948, the Brigade of Gurkhas (part of the British Army) was formed and adopted standard British Army rank structure and nomenclature, except for the three Viceroy Commission ranks between Warrant Officer 1 and Second Lieutenant (jemadar, subedar and subedar major) which remained, albeit with different rank titles Lieutenant (Queens Gurkha Officer), Captain (QGO) and Major (QGO). The QGO commission was abolished in 2007, Gurkha soldiers are currently commissioned as Late Entry Officers (as above). 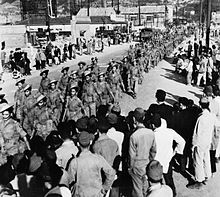 After Indian independence—and the partition of India—in 1947 and under the Tripartite Agreement, the original ten Gurkha regiments consisting of the twenty pre-war battalions were split between the British Army and the newly independent Indian Army. Six Gurkha regiments (twelve battalions) were transferred to the post-independence Indian Army, while four regiments (eight battalions) were transferred to the British Army. To the disappointment of their British officers the majority of Gurkhas given a choice between British or Indian Army service opted for the latter. The reason appears to have been the pragmatic one that the Gurkha regiments of the Indian Army would continue to serve in their existing roles in familiar territory and under terms and conditions that were well established. The only substantial change was the substitution of Indian officers for British. By contrast the four regiments selected for British service faced an uncertain future in (initially) Malaya—a region where relatively few Gurkhas had previously served. The four regiments (or eight battalions) in British service have since been reduced to a single (two battalion) regiment while the Indian units have been expanded beyond their pre-Independence establishment of twelve battalions. The principal aim of the Tripartite Agreement was to ensure that Gurkhas serving under the Crown would be paid on the same scale as those serving in the new Indian Army. This was significantly lower than the standard British rates of pay. While the difference is made up through cost of living and location allowances during a Gurkha’s actual period of service, the pension payable on his return to Nepal is much lower than would be the case for his British counterparts. With the abolition of the Nepalese monarchy, the future recruitment of Gurkhas for British and Indian service has been put into doubt. A spokesperson for the Communist Party of Nepal (Maoist), which is expected to play a major role in the new secular republic, has stated that recruitment as mercenaries is degrading to the Nepalese people and will be banned. They formed the Brigade of Gurkhas and were initially stationed in Malaya. There were also a number of additional Gurkha regiments including the 69th and 70th Gurkha Field Squadrons, both included in the 36th Engineer Regiment. Since then, British Gurkhas have served in Borneo during the Confrontation with Indonesia, in the Falklands War, and on various peacekeeping missions in Sierra Leone, East Timor, Bosnia and Kosovo. The Brigade of Gurkhas also has its own clerks and chefs posted among the above-mentioned units. Gurkhas were among the troops who retook the Falklands in 1982 and have served a number of tours of duty in the current War in Afghanistan. Additionally, a further regiment, 11 Gorkha Rifles, was raised. In 1949 the spelling was changed from “Gurkha” to the original “Gorkha”. All royal titles were dropped when India became a republic in 1950. Since partition, the Gurkha regiments that were transferred to the Indian Army have established themselves as a permanent and vital part of the newly independent Indian Army. Indeed, while Britain has reduced its Gurkha contingent, India has continued to recruit Nepalis into Gorkha regiments in large numbers. In 2009 the Indian Army had a Gorkha contingent that numbered around 42,000 men in forty-six battalions, spread across seven regiments. Although their deployment is still governed by the 1947 Tripartite Agreement, in the post-1947 conflicts India has fought in, Gorkhas have served in almost all of them, including the wars with Pakistan in 1947, 1965 and 1971 and also against China in 1962. They have also been used in peacekeeping operations around the world. They have also served in Sri Lanka conducting operations against the Tamil Tigers. A Nepalese Gorkha UN soldier. Two light infantry battalions of the Nepalese Army retain the name of the Gorkhas: Nepalese Army, also known as the Gurkha Army. Until the abolition (2008) of the monarchy (itself a Gurkha dynasty), the Gorkha units were utilized as palace guards by the King of Nepal, with one battalion always permanently deployed. The Shree Purano Gorakh Battalion was the first major Nepalese contingent deployed on UN Peacekeeping operations, when it was deployed to the Sinai Peninsula in 1974. The Gurkha Contingent (GC) of the Singapore Police Force was formed on 9 April 1949 from selected ex-British Army Gurkhas. It is an integral part of the Police Force and was raised to replace a Sikh unit which had existed prior to the Japanese occupation during the Second World War. Recently the GC can be seen patrolling the streets and have replaced local policemen to guard key installations. The most recent deployment of the GC was to provide additional security for the Singapore Airshow, Asia’s largest airshow, and the hunt for the escaped terrorist, Mas Selamat. The Gurkha Reserve Unit is a special guard force in the Sultanate of Brunei. The Brunei Reserve Unit employs about 500 Gurkhas. The majority are veterans of the British Army and the Singaporean Police, who have joined the GRU as a second career. A considerable number of ex-Gurkhas and their families live in Hong Kong, where they are particularly well represented in the private security profession (G4S Gurkha Services, Pacific Crown Security Service, Sunkoshi Gurkha Security) and among labourers. Ex-Gurkhas left their barracks and moved into the surrounding urban area. There are considerable Nepalese communities in Yuen Long and Kwun Chung. After the Federation of Malaya became independent from the United Kingdom in August 1957, many Gurkhas became soldiers in the Malayan armed forces, especially in the Royal Ranger Regiment. Others became security guards, mainly in Kuala Lumpur. The United States Navy employs civilian Gurkha contract guards. Some work alongside Army, Air Force and Navy personnel in day-to-day operations, notably as sentries at its base in Naval Support Activity Bahrain and on the US Navy side of the pier at Mina Salman. Others work as security forces at the United States Embassy in Kabul, Afghanistan. Gurkha contract guards were used to guard key facilities in Iraq during Operation Iraqi Freedom. The guarded facilities included Baghdad International Airport and the Al Rasheed Hotel. Ethnically, Chhetri (Thakuri), Gurung and Magar were the Gurkha tribes who united Nepal and fought against the British invasions. But today, Gurkhas mostly belong to the Chhetri (Thakuri), Tamang, Gurung, Magar, Rai, Limbu, Newars and Sunuwar, and members of any Nepali tribe can join the Army. All Gurkhas, regardless of ethnic origin, speak, in addition to their group language, Nepali, also known as Khas Kura or Khas Bhasa. Their large knife, called the kukri, became iconic and is featured in a curved configuration on their emblem. Gurkhas traditionally returned to their homeland of Nepal following their military service, to resume a life of subsistence farming or labour. The country’s poor infrastructure and lack of welfare system led to a high number of ex-Gurkhas facing destitution. When the extent of their hardship came to light in the late 1960s, officers in the British Army established a charity – The Gurkha Welfare Trust – to ensure that all former soldiers would live out their retirement in dignity. In the mid-1980s, some Nepali speaking groups in West Bengal began to organize under the name of Gorkhaland National Liberation Front, calling for their own Gorkha state, Gorkhaland. There have been twenty-six Victoria Crosses awarded to members of the Gurkha regiments. The first was awarded in 1858 and the last in 1965. Thirteen of the recipients have been British officers serving with Gurkha regiments, although since 1915 the majority have been received by Gurkhas serving in the ranks as private soldiers or as NCOs. In addition, since Indian independence in 1947, Gurkhas serving in the Indian Army have also been awarded three Param Vir Chakras, which are roughly equivalent. The treatment of Gurkhas and their families was the subject of controversy in the United Kingdom once it became widely known that Gurkhas received smaller pensions than their British counterparts. The nationality status of Gurkhas and their families was also an area of dispute, with claims that some ex-army Nepali families were being denied residency and forced to leave Britain. On 8 March 2007, the British Government announced that all Gurkhas who signed up after 1 July 1997 would receive a pension equivalent to that of their British counterparts. In addition, Gurkhas would, for the first time, be able to transfer to another army unit after five years’ service and women would also be allowed to join—although not in first-line units—conforming to the British Army’s policy. The act also guaranteed residency rights in Britain for retired Gurkhas and their families. Despite the changes, many Gurkhas who had not served long enough to entitle them to a pension faced hardship on their return to Nepal, and some critics derided the Government’s decision to only award the new pension and citizenship entitlement to those joining after 1 July 1997, claiming that this left many ex-Gurkha servicemen still facing a financially uncertain retirement. A pressure group, Gurkha Justice Campaign, joined the debate in support of the Gurkhas. In a landmark ruling on 30 September 2008 the High Court in London decided that the Home Secretary’s policy allowing Gurkhas who left the Army before 1997 to apply for settlement in the United Kingdom was irrationally restrictive in its criteria, and quashed it. In line with the ruling of the High Court the Home Office pledged to review all cases affected by this decision. On 29 April 2009 a motion in the House of Commons by the Liberal Democrats that all Gurkhas be offered an equal right of residence was passed by 267 votes to 246. This was the only first day motion defeat for a government since 1978. 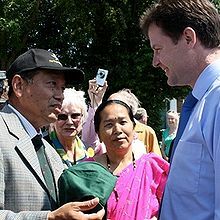 Nick Clegg, the Liberal Democrat leader, stated that “This is an immense victory […] for the rights of Gurkhas who have been waiting so long for justice, a victory for Parliament, a victory for decency.” He added that it was “the kind of thing people want this country to do”. On 21 May 2009, the Home Secretary Jacqui Smith announced that all Gurkha veterans who retired before 1997 with at least four years service would be allowed to settle in the UK. The actress Joanna Lumley, daughter of Gurkha corps major James Lumley, who had highlighted the treatment of the Gurkhas and campaigned for their rights, commented: “This is the welcome we have always longed to give”. On June 9th, 2015, a celebration called the Gurkha 200, held at The Royal Hospital Chelsea and attended by members of the royal family, will commemorate the bicentennial of the Gurkha Welfare Trust by paying tribute to Gurkha culture and military service. A 2008 UK High Court decision on a test case in London, R. (On the Application of Limbu) v Secretary of State for the Home Department ( EWHC 2261 (Admin)), acknowledged the ‘debt of honour’ to Gurkhas discharged before 1997. The Home Secretary of State’s policy allowing veterans to apply on a limited set of criteria (such as connection to the United Kingdom) was quashed as being unduly restrictive. The Court found that the Gurkhas had suffered a “historic injustice”, and that the policy was irrational in failing to take into account factors such as length of service or particularly meritorious conduct.